Packing for your gap year may be one of the most important steps you take to ensuring your future success. Packing too many items can lead to a sore back, aching shoulders and misery down the road, yet packing too few items can lead to shivering with cold or burning with a fever. Obviously the happy medium will be different for every gap year traveller, but these packing tricks should help everyone leave home well packed and well prepared! In your closet chaos may reign, but packing for a gap year requires organisation. Remember that everything you pack you will also need to carry, so try to keep your possessions to a minimum. Also, some travellers like to bring bulk items (shampoo, sunscreen, etc.) but these can be heavy and easily be purchased along the way. Be sure that you are certain everything you pack is essential by laying it all out before you pack your bags. Include: clothes, underwear, outerwear, personal care items, health care items/medical kit, travel documents and travel accessories. When it comes time to packing your supplies, not just any suitcase will do. In fact, discard the idea of bringing a suitcase at all and instead invest in a quality backpack or rucksack. Bring along a daypack for your daily supplies and to carry aboard your flights, and your luggage will suddenly seem much more manageable. When shopping for a pack look one that offers wide, padded shoulder straps and a strap to fasten around the waist, try before you buy - comfort is key here as you will be carrying it a lot! Check that it is made of lightweight, preferably water resistant material and that it features a padded back panel (remember comfort). 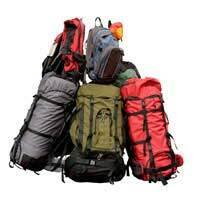 Of course check that your chosen pack is going to be big enough and supplies plenty of internal pockets for your possessions and can accommodate a bedroll or sleeping bag. Travelling light will require you to leave some of your favourite belongings at home. Gap year travel is not luxurious by any means, and you can't always be sure of safe surroundings, so leave behind possessions such as, your laptop, other expensive electronicsand jewellery, designer clothes, hair dryer/hair straighteners and also top of the line digital cameras and mobile phones. While the idea of packing for a full gap year may seem daunting, once you begin weeding out your unnecessary items the task will be far less difficult. If you have booked a gap year placement through an agency, solicit their packing advice to make sure you don't leave out anything important and rest assured that there will always be items available to purchase while you travel. In fact, even if you left home with an empty bag you'd return home overwhelmed, so try to leave a little room for all of your souvenirs! Good luck!